Cousins' Cabana-Top Rated, Ocean Front - It's Time to Plan Your Fall Get Away ! Directly on the Beach with breathtaking view of the Gulf!!! COUSINS' CABANA at The Villas at Sunset Beach is an elegant privately gated community and the second floor end unit directly on the beach has views in every direction. And what a beach it is, voted one of the best beaches in the world! 2. KITCHEN - all new and professionally designed with custom cabinets, granite counter tops, glass tiled backsplash, and top of the line stainless steel appliances. 3. LIVING & DINING ROOMS - new area rugs, all new furniture in the living room, including upgrading the TV to 65" with HD & 4K with a Sharp surround sound system. The Dining Room has a new buffet, artwork and designer lighting. 4. ALL BATHS - are updated with new custom cabinets, lighting, granite counter tops, and new toilets. The master bath was also updated with a new full spa tiled rain shower and granite and glass tile surrounding the jetted tub for two. 5. MASTER BEDROOM - All new bed linens and furniture, including a king tempurpedic mattress, a 55" HD TV. The lady's dressing room has been updated with custom cabinetry including her own vanity and dresser and the bedroom has a large dresser for the man of the house. 6. FRONT KING BEDROOM - has all new furniture and bed linens and a 37" TV with WiFi connected DVD. The new king mattress is the top rated by Consumer ReportS (NovaForm memory & gel bed). 7. THIRD BEDROOM - Has been furnished with a new bunk bed (an XL Twin over Queen) new foam/gel mattresses on both beds, new furniture and bed linens. This room has a 37" TV with WiFi connected DVD. PLEASE NOTE THE WEIGHT LIMIT FOR THE UPPER BUNK IS 125 LBS. 8. BALCONY - Has new decorative pillows on the conversation area and has a balcony height table with 4 chairs which have been newly reupholstered. While the outside gives guests the feeling of a lovely Mediterranean villa, the inside offers comfort that makes one feel like they are truly in a modern tropical paradise. Each room has been tastefully decorated with designer decor with your comfort in mind -- a retreat for every season! The living area provides not only the ocean view, but also the view of the pool. The kitchen is fit for a professional cook and extremely well equipped, a perfect place to make toast or a 5-course gourmet dinner. The adjoining dining area is large and spacious and includes table and chairs for 6 as well as a bar dining for four. The living room includes lots of comfortable seating and a gas fireplace for the entire crowd to gather. The new 65" HD-4k flat screen TV with Sharp surround sound system, HD cable and a Blue Ray DVD player (along with complementary video collection & WiFi connections) provides the perfect setting to enjoy sports or to have a movie night for the family. The sound system is Bluetooth compatible so you can play your favorite tunes from your phone. There is even a full collection of board games and books in the armoire. We have taken care to anticipate the needs of our guests. The balcony is the perfect extension of the living area and is fully furnished and allows for Gulf-view dining or lounging with the sound of the waves providing the background music. There is NO bad view in the unit! The master bedroom is a true sanctuary. With a king sized Tempurpedic Cloud bed, luxury linens, iHome stereo (iPhone 6 compatible), a 55” HD flat screen smart TV, private sitting area, his and her vanities and dressers. The adjoining bathroom is a total Spa featuring a jetted bathtub for two, large walk-in shower with rain shower head, separate dressing room and generous closet, what more could anyone ask for! The sitting area is perfect for reading your favorite book or having you morning coffee in the bay window. There is really nothing like waking up to the view of your own palm tree. The other two bedrooms (each with their own bath) are comfortably appointed one with a king bed and the other with an XL twin (NOTE: 125 lb weight limit) over a Queen bunk bed and both have 37" TV’s with WiFi connected BlueRay DVD's. All bedrooms have memory foam/gel mattress and custom-made linens that were designed specifically with the guest in mind. Overall 2,100 square feet give our guests and their families plenty of room to get together and lots of nooks and crannies in which to enjoy some alone time. Whether you want to spend time in the sun by the ocean front heated pool, lounge on the beach, swim in the surf, walk to Rosemary Beach for shopping, “doing” lunch, or just relax inside in the cool, comfort, and quiet - you have it all in this outstanding villa-Cousins' Cabana (Unit C-201)! Please note that the rental does include linens for the condo but does not provide any beach towels. Beach chair rentals are available for an extra charge from the SeaOats Beach Services who maintains a kiosk on the beach. We also try to keep the condo equipt with several beach chairs for complementary use of our guests. Carl & Beth (from Nashville, TN) and Jeff & Debbie (from Atlanta, GA) are cousins with a common love of the 30A area. When they found Cousins' Cabana they knew it was "it" from the moment that they walked into the living room and saw the 180 degree view of the Gulf before them. And after they purchased and moved in, they knew it was the perfect place for them to enjoy time together with the family. Cousins' is distinct since it is not just a "rental" but is primarily furnished and decorated to be the Cousins' home away from home. The Cousins have loved the 30A area and had been coming down for family breaks for years. 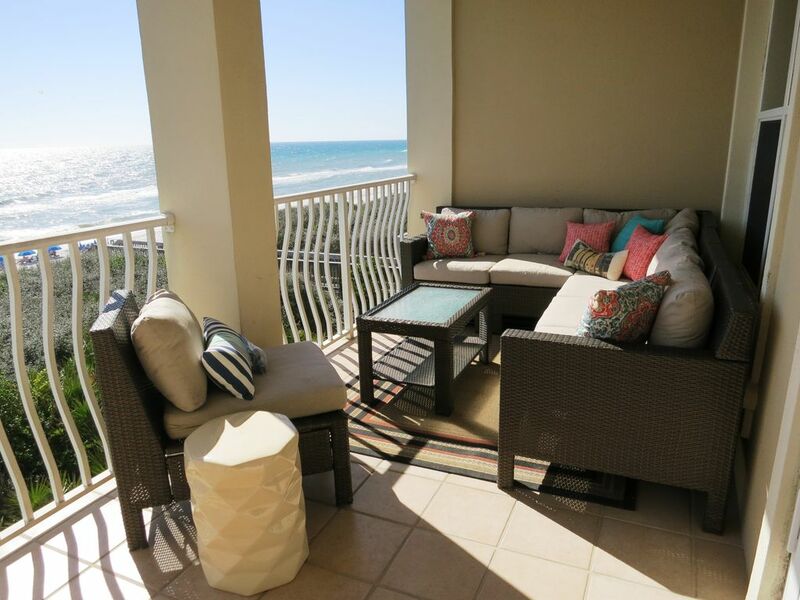 However, the Villas of Sunset Beach offered not only the perfect condo but also set back and away from the congestion of 30A and directly on the beach with perfect views of the sand, surf and sunsets!. Although a peaceful retreat, Cousin's Cabana is next to the pool and the steps down to the beach. The town center of Rosemary beach is only a short (less than 5 minute) walk for shopping and dining. Alyse beach resturants are just 5 minute walk in the other direction. The Villas take pride in their pristine wide beach. Now that we have completely renovated the condo, it is absolutely spectacular. 3 full baths, 2 ensuite and one accessible to the bunk bedroom and the hall. Within easy walking distance to the restaurants and shops of Rosemary Beach, Seacrest Beach and Alys Beach. Just steps from the beach with beautiful views from the balcony for sunrises, sunsets and everything in between! 550 count Egyptian cotton sheets and decorator linens. Ultra large and fluffy towels. PLEASE BRING YOUR OWN BEACH TOWELS, since no linens are to be removed from the condo. Super setup with lots of comfortable seating, 65" 4K HD Smart TV with full surround sound system which can be connected to your Netflix acct. Great for enjoying sports and movies with the family! Electric with 4 burners and a large convection oven and a warming drawer. Full dishes, glasses, silverware, pots & pans, bakeware and serveware. If we don't have it, let us know we will do our best to have it for you on your next visit! Dining table seats 6 easily and the adjoining breakfast bar seats 4 more. Outdoor table for 4. Digital Cable, Master and Livingroom have HD. Sound system in living room has Blue Tooth connectivity to play your favorite tunes. Master has an iHome. BluRay DVD's in livingroom and in all bedrooms which connect to WiFi for streaming. Family board and card games in LR armoire. Some beach toys and extra beach chairs are available, located in the hall linen closet between the bunkroom and the hall bath. Various videos including children's movies. The building is set in a tropical garden environment including a Palm lined promenade. Gorgeous balcony directly overlooking the ocean with lots of shade and breezes. Furnished with both a dining and sitting area. No bikes are provided by the Cousins', however, bike rental is within a block and there are 19 miles of bike and walking trails adjacent to the development. Surrounded by golf courses all along the 30A and the Destin area. Golf, Beachwalking, Excellent shopping & dining at Seaside, Grayton, and Rosemary Beach, Grayton State Park--12 minutes away, Bike Path from this condo all the way to Blue Mountain, approximately 8 miles, Walk to Rosemary Beach Town Square in less than 5 minutes, Drive to Seaside & Grayton shops in 10-15 minutes or the outlet mall in 25.